One of the biggest accessory trends of 2012 has been the detachable collar. 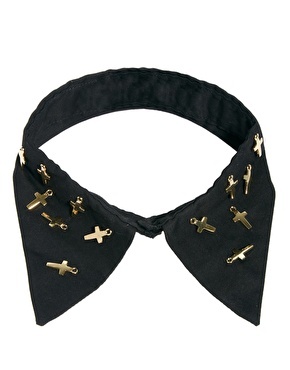 They have taken over every high street fashion store, mainly in the form of the Peter Pan collar. A detachable collar is an easy and quick way to update an outfit. It can be worn over a plain top or jumper or as an alternative to a necklace. As the androgynous trend gets into full swing this Autumn/Winter, Peter Pan collars have taken somewhat of a back seat and the simple shirt collar is now centre stage. 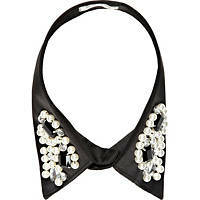 These collars, whether adorned with studs, beads or jewels; will add a masculine edge to your outfit. While these collars are lovely, they are overpriced. You can easily make your own unique collar without spending a cent! If you do have to buy some of the materials it will only cost you a few euros. You will need – an old or second-hand shirt, scissors, a needle, thread the same colour as the shirt, a selection of stud earrings and backs. If you don't have odd earrings in your jewellery box you can buy packs of earrings in Penneys/Primark for €3 or less. Carefully cut the collar off by cutting below the band of the shirt. The band is where the top button is situated. Fold down the band and with a needle and thread tack it to the base of the collar. This isn’t a necessary step as the band is usually stiff enough to stay in place, good news if you can’t sew! However, if you can’t sew but you do want your collar to be extra sturdy you could glue the band down. Select the earrings you want to use and put them through the collar in your desired pattern. Secure the earrings with earring backs. I opted for a simple design using studs, pearls and diamante earrings but you could go for something a bit more elaborate and pile on the jewels! You could also sew on a prettier button or replace it with a brooch. Not only is this collar your own creation but you can reinvent it over and over again by changing the earrings (see below).